Ann Elliott, a three-time NCAA champion as a player and a coach at Northwestern, shares some basic core drills that will challenge even the most skilled players. Coach Elliott's drills are done at game speed to reinforce the quick decision-making needed in pressure situations. The presentation begins with a discussion of Coach Elliott's stick work philosophy and the need to be a triple threat at all times on offense. Coach Elliott shares seven primary drills that progress from stationary to moving positions to create soft hands and develop the off-hand. 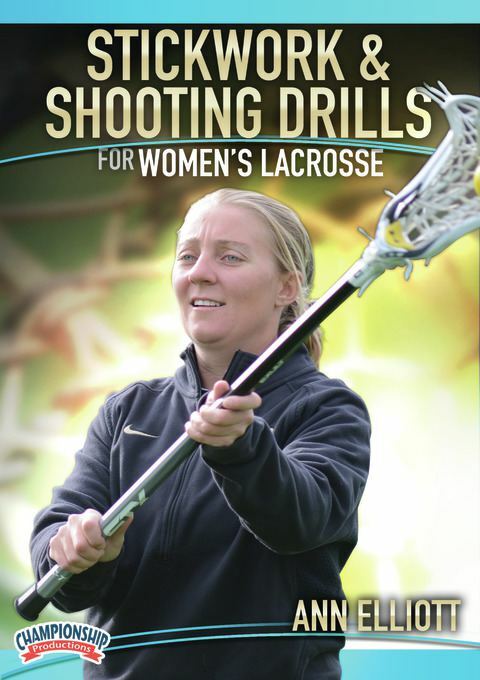 She begins with a series of short passing and catching drills using strong hand and weak hand. Also included in the segment are one-handed drills. Coach Elliott then demonstrates a series of 30- to 50-yard passes that can be used to develop confidence and precision. She increases the speed of the drills to create game speed conditions, placing players in a sprint, shuffle, back pedal and rolling evolutions. Coach Elliott then challenges players using a quick stick with a dodge roll to keep them focused on their stick positions. Coach Elliott adds defensive players into the drills, forcing offensive players to focus on their stick position and to recognize defensive slides and double teams. This trains athletes to take advantage of moving the ball to the open player while being confined in a tight space. A ground ball element is built into the drill to work on fielding ground balls under pressure. Coach Elliott gives a whiteboard discussion of drills before moving to the field for a live action demonstration. Incorporate these drills and make your players an offensive threat. Starting with the basics, Coach Elliott shares her philosophy on how players need to hold their sticks to maximize power and maintain a triple threat position with the stick. Her drills emphasize footwork and proper hand position . Coach Elliott demonstrates a series of drills - from stationary to shots on the move - that focus on increasing body position and power. The "Cross Arc Shooting Drill" forces the shooter's hips to rotate to goal and adds in a rollback when the shooting angle becomes too small. Using a combination of drills, Coach Elliott progresses to more complex shooting drills, with and without defensive pressure, to challenge both the offensive and defensive players. This allows players the defensive slides and double teams to take advantage of them for increased scoring opportunities.